Lake Tahoe Sleigh Rides is no longer available. It is unknown if or when they will be available again. 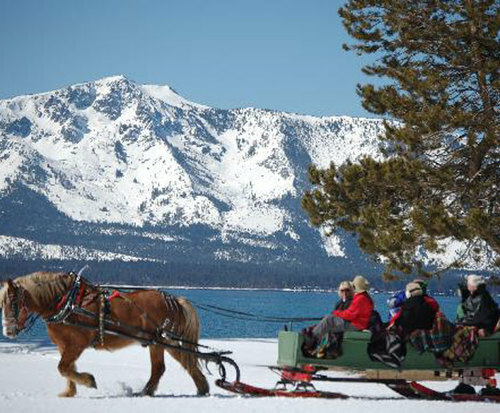 A Lake Tahoe Sleigh Ride takes you dashing through the snow around Lake Tahoe. A perfect outing for a winter day this sleigh ride on an antique European sleigh is unbelievable. Complete with cozy blankets for cuddling, you are taken over the meadow and through the woods to a peaceful spot overlooking Lake Tahoe. Bring your camera and the driver will happily take a picture for you with Lake Tahoe in the background, for a great memory or perhaps your next Christmas card. 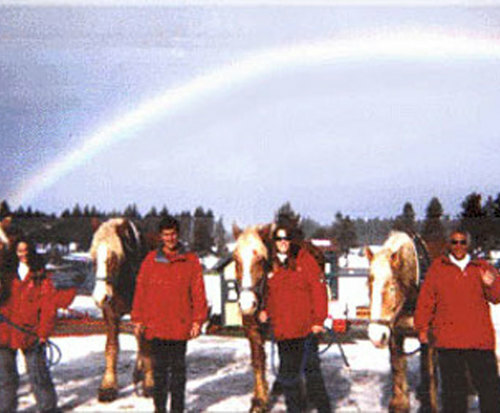 The experienced driver is also a storyteller who will delight you with tales of the area as you enjoy being pulled by a team of one-ton Blonde Belgian Draft Horses, for your half hour or one hour tour. The sleigh ride operates weather permitting. In case there is not snow enough for a sleigh ride you will be taking a horse-drawn carriage ride. 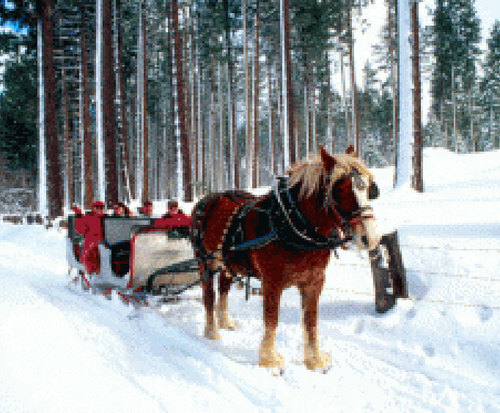 I signed up for the lake tahoe sleigh ride thinking we would be going up in the woods in the snow overlooking the lake. However, that didn't happen. There wasn't much snow so instead we were given a carriage ride with just the 2 of us. Our driver new what she was doing and it was a nice ride, it was very cold but we keep warm. We rode around the streets and went down to the lake, but not up in the woods that over looked the lake. I was hoping to get a picture of us on the sleigh in the trees overlooking the lake, a picture that we could use for next years christmas cards but that didn't happen. We did have a nice ride anyway.